Here is another article to propose ideas on how to improve perspective tool. As usual, only mockup and ideas here. No codes. I made it because I felt driven by the sincere desire to propose a cool design. Solving problems on user side and designing an ultimate feature was a fun brainstorm for me. The user select the perspective tool in the toolbar , then click four point on the canvas around a rectangular ( can be irregular ) area. This define the world limit. 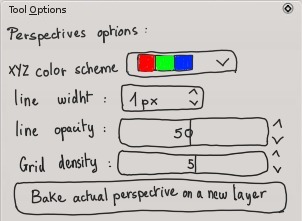 Just after releasing the 4rth click, Krita change the area for the default perspective widget. On this comic frame sketched , no need of a third vanishing point. By clicking the red cross next the blue dot , the dot is removed. 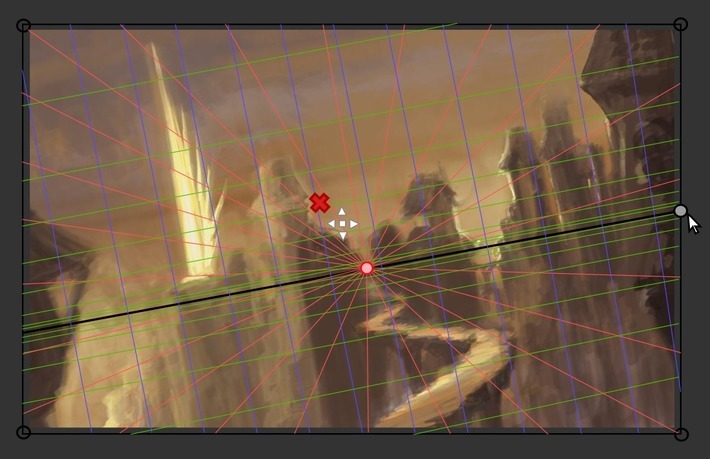 Krita then propose verticals blue lines ( two vanishing point mode ). Luckily, horizon line is placed at 1/3 up by default , similar than on my sketch. 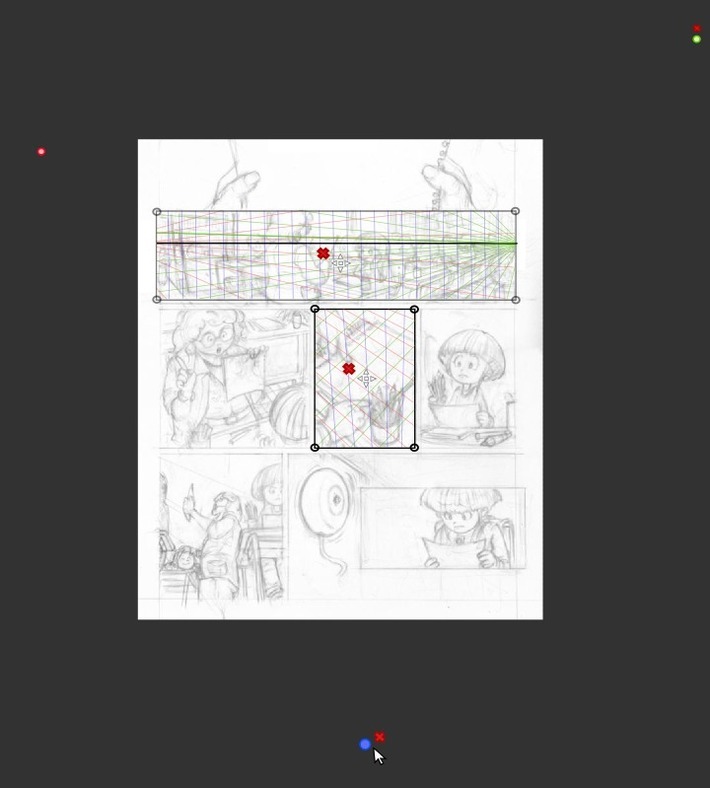 I just need to drag&drop the red dot a bit outside the canvas to adapt my red perspective grid lines to fit my sketch scene. While I'm dragging the red dot around, all the red line inside the area keeps changing to target the point I'm moving. I can see the change in live. - A grid density defining the amount of subdivision of the minimum amount of rays. - A button to 'Bake' the lines into a new pixel layer : useful to save lines for a ORA or PSD export or to do a Transform warp on a baked perspective to bend lines , or for user who prefer to turn visibility of the perspective using layers. Here is a mockup after user increased density and switched to the freehand painting tool to start detailing on a solid perspective grid. The widget disappear, only the colored 3 axis grid remain. They can then activate 'Assistant' on the tool option and draw with a magnetic way on the 3 proposed axis. ( ex: to ink his background , objects ) Also the grid gives sensors information to the input dynamics 'Perspective' in the brush editor. User can decide then to map pressure or brush size to follow a variation according the perspective. Area 'world limit' are designed to let comic/manga artists to setup multiple perspective area on a single document opened. Zooming out the canvas can help to place distant vanishing point outside the canvas , on the borders. If you remove the Green and Blue dots ( you can't remove the Red by design ), you fall into the single vanishing point mode ( the two other axis are then perpendicular ). Note : to solve a special use case 'Tilting the horizon line on a single vanishing point perspective' a new gray dot appear on the horizon line ( or take the place of the old Green Y one ) and let user tilt this line. I studied many 'perspective feature' on other 2D softwares and studied videos tutorials to produce this article. I hope this document will inspire or help ( or even only influence a bit ) the development of a solid perspective tool. Note : Screenshots in this article are mockup done with Inkscape. The comic page used is a old test page of my graphic novel project L'héritage en couleur. License: CC-BY David Revoy, www.davidrevoy.com, 3 february 2013 . GREAT proposal man. I am all for THIN and SEMI-TRANSPARENT lines. It suppose to help me after all and will not do so by covering picture ;). This would be plain GOLD! It is very powerful and intuitive, but tied to the Microsoft Windows platform, unfortunately. I hope someone finds it helpful, for one purpose or another. David, thanks for your work! Cheers from Russia! @Silvio Grosso : Oh great. Good news for Gimp users. Nice to see every project growing. 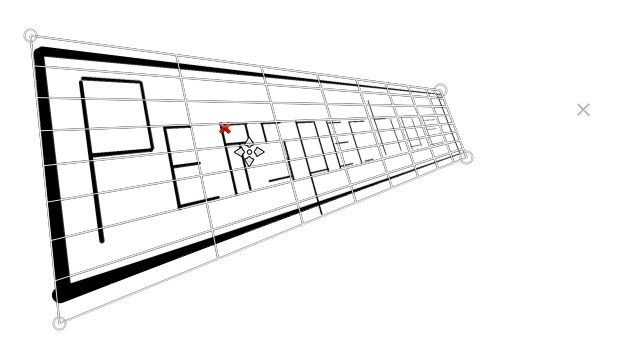 @Alex1988 : http://www.ctrlpaint.com/perspective-grid-utility/ Revelation ! thanks for the link. I don't think I can run that on Linux ( note : tried on Wine , but didn't worked ) , but I feel flaterred to had found a similar design with grabbable 'dot' vanishing point, and terms like 'density. Your video link is really a good addition to this article as a reference. @Silvio Grosso, there is so many improvements in 2.10, cool! Faster rendering, CPU/GPU multi core support - sounds great, I have a powerfull desktop, so hope that will increase performance greatly. Thx for the news! I am going starting work on this tool and will try to make it as helpful as possible, but, will need help from probably all of you. @David, it's a great idea you have come up with, thanks a lot for that :). Will get in touch with you for discussing the flow of the tool soon. @Alex1988, the link isn't working, can you please find the video again. It seems like, it can help me a lot with the development of the tool. @Shivaraman : Hi , cool ! I'll be on IRC, mailing list, or anywhere. Do you want I migrate this documentation to the WIKI development of Krita ? Indeed a cool demo of the Win freeware 'Carapace' who got cool feature. Sketchstick yesterday on IRC told me an interresting thing about : 'perspective point' , they should not have only a 'X' to delete them , but also an 'eye icon' to toggle visibility off/on of the perspective point, because sometime, grid can become complex. @David: Yeah cool will talk to you soon on IRC. Well, I'd like to discuss as to what all should we put in the WIKI development of Krita, according to the flow I would like to follow on the development. I'd look into that video, hope it is helpful. Nice idea indeed, have added it to the list of TODOs for the tool.Now its time to make Krita more handy. So why should you choose a scissor lift in the first place. tests after studying different unijts of information. 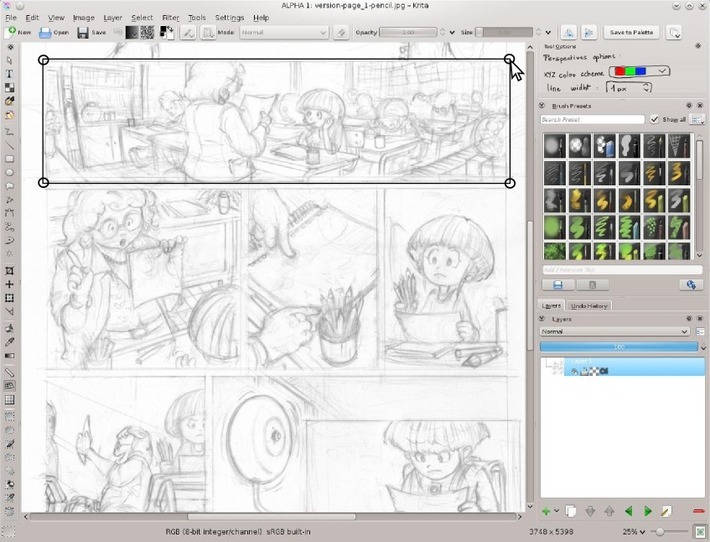 It's me again, with more idea and rebukes, that will help strengthen the quality of Krita. I'm talking about Insane Bump. That is just for Gimp. I have a look at it. And I liked it, because it is a very good plugin for those who like to work with map 2d and 3d. Just do the same as others that improves one thing and make others worse. You can put more this feature but do not remove or damage the normal map that is already there. process of the animation object at the time of transformer on the map "the animated character after being transformed into the normal map". I did an animation, I painted everything and I left everything ready. In so I want to turn all animation into a normal map format. At the time the soft could not come up with that. I will certainly be very frustrated. In case you did not understand about the hospitalizations between soft and other plugins. I do a normal map in a plugin, and I want to improve this mappin; more use another plugin, so this plugin it has to do its calculation and rendering apartir and on top of that mappin that was done. The same would be with another soft being it 2d or 3d. because this plugin would get the data of this mappin out of this "software" and do a calculation and rendering on top of that mappin. I saw other attributes of or other software and had noticed, you do not have some items that an artist need. One of these items and magic pen of photoshop and the others and what comes with him, you therefore these items are very important for effect. The other is window of the "path" same as have on photoshop, as it is used to connect with 3D .software with cinema 4D. And you guys see well about the plugin I told you. Quixel nDo2 and Insane Bump. deformed = sculpture, this is very nice to do 3D effect. missing more some items as polishing the sculpture because the final topology stays a lot strange. Hey Diogo; this article was published in 2013 and I'm affraid no Krita developer visit this link. If you want to submit idea for development ; maybe the Krita forum will be a better place to reach the dev.